Did you know that you can make homemade ice cream without a fancy machine? It’s easy, and only adds a little extra hands-on time. And for this rich, custard-based ice cream recipe, a bit of stirring by hand is utterly worth it. It tastes really, really good. In fact, I’m pretty sure this recipe will turn any ice cream apathetic into a raving fan. Personally, I think the custard is key to making this the best, most spoon-lickin’ good ice cream you’ve ever tasted. Ice cream recipes without a machine tend to be a little more icy and a little less creamy, but using a custard base ensures a creamier end product. You don’t need any special equipment, although I would suggest freezing the custard in a shallow dish to speed up the process. When I made this ice cream the first time, I froze it in a deep bowl and it was a painful test of patience to wait for it to harden. Now, I make it in a large, shallow glass baking dish and it’s ready after a Netflix episode and light housework. I’ve included two variations to try: a special rum and raisin for the adults, and a berry one for everybody! When adding mix-ins like berries (or candy pieces, cookie dough, fruit, etc), I like to do it the Coldstone way and stir them in just before serving. You can taste the flavors of the mix-ins better than if you let them freeze and harden into the ice cream. Glance over this recipe and you’ll see the possibilities. I’m sure you can come up with enough variations to keep you eating ice cream all summer long! Not a problem, right? 1/2 to 2/3 cup maple syrup depending on how sweet you like it! 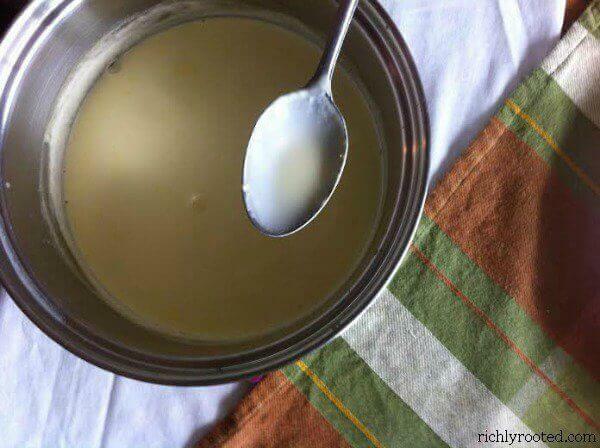 Heat the cream, milk, and salt in a saucepan over medium heat. Whisk the egg yolks together in a separate bowl. When the cream begins to simmer gently, pour about 1/2 cup into the egg yolks, stirring constantly. Pour the egg yolk mixture into the saucepan in a thin stream, stirring constantly. Turn the heat down to medium-low and stir the mixture for 3 to 5 minutes, until it begins to thicken slightly. Remove custard from heat. Stir in maple syrup and let cool. 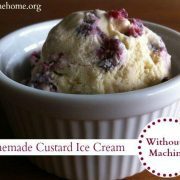 If you're using a machine, chill custard in the fridge for 4 to 12 hours and then proceed according to the manufacturer's directions. If you're making ice cream without a machine, pour cooled custard into a baking dish, cover, and place in freezer for 45 minutes. After 45 minutes, pull custard out of freezer and stir mixture vigorously. Return to freezer. Continue stirring custard every 30 minutes until frozen through. (About 3 to 4 hours). 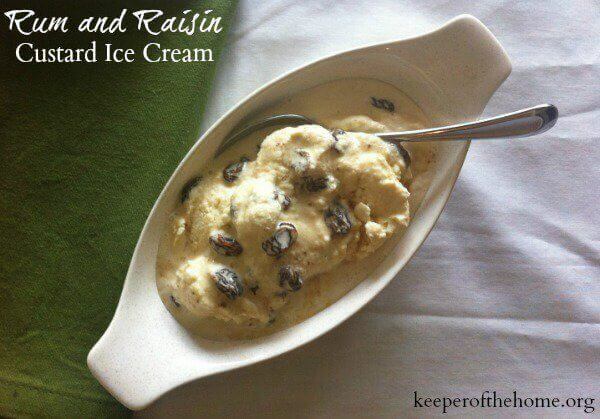 While you're waiting for the cream to warm up in Step 1, stir together 1 cup raisins and 1/4 cup rum. Cover and refrigerate. Stir 3 Tablespoons of rum into custard mixture in Step 4. When ice cream is ready, remove from freezer 10 to 15 minutes before serving to allow ice cream to soften slightly. Add rum-soaked raisins and stir to barely combine. Serve immediately. Make ice cream. Remove from freezer 10 to 15 minutes before serving to allow ice cream to soften slightly. Add 1 cup of your choice of berries and stir to barely combine. Serve immediately. Want more simple real food dessert recipes? Check out the dessert section of my cookbook, Real Food for the Real Homemaker! And for the ultimate ice cream recipe round up (with over 60 recipes! ), check out this post. 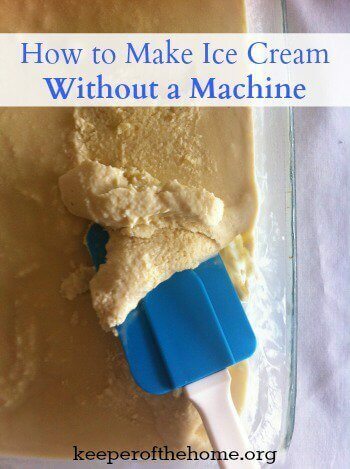 Have you ever made ice cream without a machine? 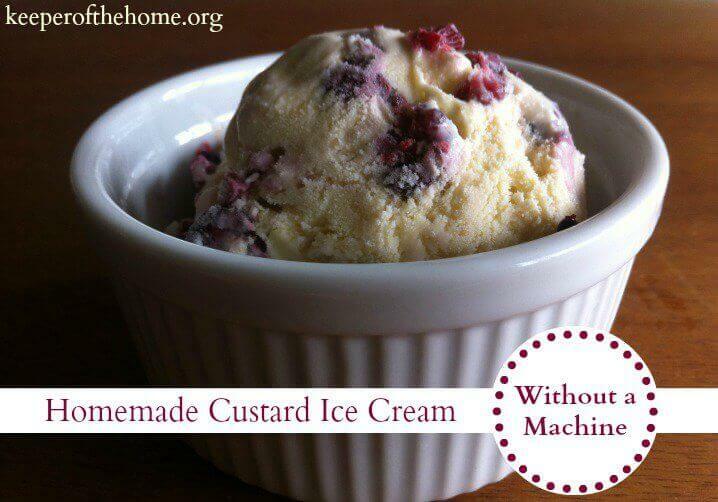 What’s your favorite way to top homemade ice cream? Nowadays, I whip up ice cream with my Kitchenaid mixer attachment ($10 yard sale steal!). It conveniently lives in the freezer and doesn’t take up all the storage space of a regular sized ice cream maker. Could you make the custard using a double broiler to help preserve the enzymes in the raw milk or is this being heated up too high for that? Mmmmmm!!! This was incredible! I cut the milk in half because I didn’t have much left. The frozen custard that resulted was soft but very delicious and rich and creamy. I used the lesser amount of maple syrup and was plenty sweet for us! And oh yes, I did use our ice cream maker and it worked wonderfully. Thank you for a semi-healthy frozen treat. I am so glad you loved it! Thanks for telling me! Sounds delicious! Would it have a strong maple flavor? Could I use sugar instead maybe? Trying to make a vanilla bean custard ice cream using vanilla bean paste..
Lovely creamy ice-cream and so easy to make. Thank you for making it so straight forward!